The project team has gotten some questions regarding sustainable elements in Aztec Student Union. Today’s post, the first of a monthly series, seeks to answer one of them. The pre-function area between the theater and Montezuma Hall has many of its trusses installed, thanks to the amazing team! Here, a truss peeks out from above the “dance floor” installed atop the theater (see the blog post from Jan. 14 for more about the dance floor). That’s a lot of wood! 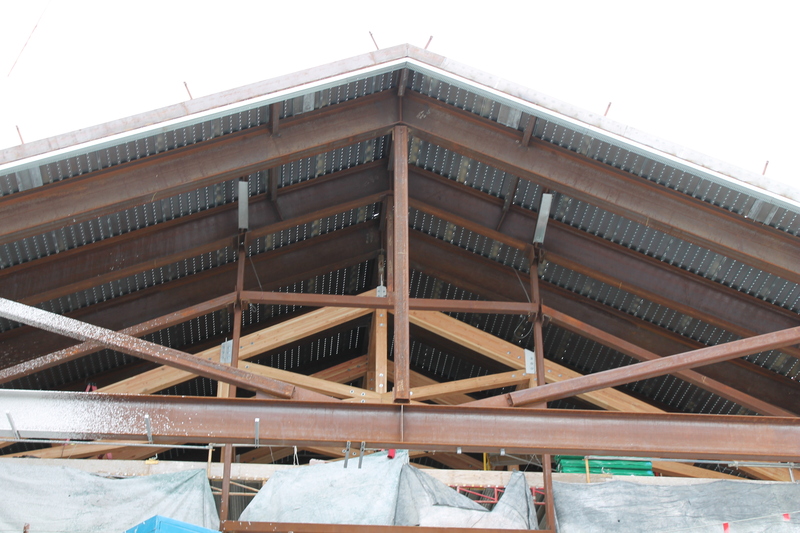 But, for something built LEED platinum-certified, how could that much wood be sustainable? 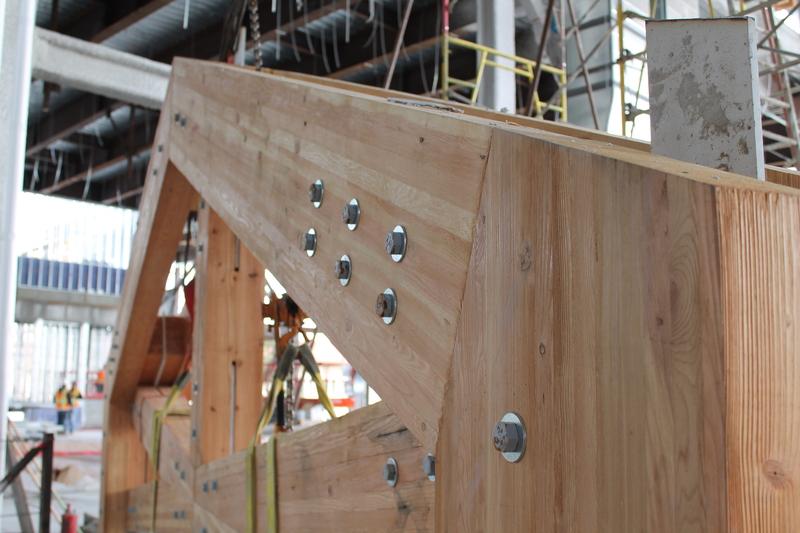 An up close and personal look at a truss waiting to be installed in the pre-function area. 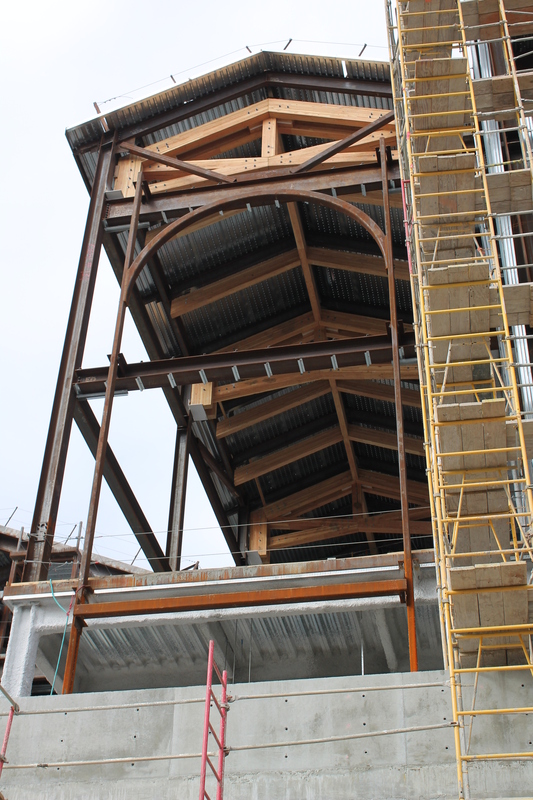 While the wood trusses look enormous, they’re actually composed of layers of wood that have been pressed together into the lovely truss shape you see above. And all of those layers are from Forest Service Council (FSC)-certified wood from sustainably managed forests. Do you have a question about Aztec Student Union? Please comment on this post, or ask via Facebook or Twitter. Can’t get enough Aztec Student Union? Be sure to “like” it on Facebook, follow it on Twitter or check out the live construction camera on the website. This entry was posted in Construction and tagged FAQ, green note, LEED, sustainability. Bookmark the permalink.